I never wanted to be a coach. That is one thing. But when it was posed to me as a challenge, I am drawn to challenges. I’ve been that way my whole life. Relationships are probably the key aspect to my success as a coach, and it goes back to my experience as a collegiate student-athlete at the University of Virginia. My coach and I had a love-hate relationship, partly because I was an unruly teenager and I was from the projects in North Philly and was going to a predominately white institution. I just really didn’t transition well. I didn’t know how to handle myself and I just wasn’t receptive to the way somebody else wanted me to be. But there are certain things that shape your life to where you end up meeting the people that you think you don’t need and that is how it was with my coach, Debbie Ryan. My first year of college, I had a really hard time academically and – I am not ashamed to say it – I almost got kicked out of UVA. I had to talk to the dean and I didn’t have all your perfect etiquette in speaking to a dean. I was shy and really needed her to pull some strings and didn’t understand how to deal with people in this manner. I didn’t give her eye contact, I mumbled and didn’t articulate myself well. They were going to kick me out of UVA, and wanted me to take a Spanish class in the summer. But I had an opportunity to go play with USA Basketball in Spain and my coach was the coach for the team. Again, we had an alright relationship, not a strong one. I was not talking to her about my problems or anything like that. It was your regular coach relationship. You get what you are comfortable giving, and I wasn’t comfortable giving anything. I was actually in Colorado Springs preparing to go to Spain when they called me about the grades coming out. Debbie came up with a great idea that prevented me from getting kicked out. She suggested I should be allowed to skip summer school and go to Spain and use the journey to have my Spanish experience, which she felt was a better opportunity to really experience the culture than actually being in a four-walled classroom. That is when I knew Debbie had my back. I knew I needed Debbie. She saw that of course I wanted to play basketball and I also wanted to get good grades, and she was able to strike that balance with the dean to allow me to play and make this happen. That instantly gave me a little bit more trust in Debbie. It is shallow, but it was shallow of me being 19 and not wanting to go back to UVA in the summer for school. But that really made an impact on me when I was challenged to be a coach. I knew the impact I could have in young lives through playing the sport of basketball. That is what I really love. I took my first head coaching job at Temple sight unseen. Although I was from North Philly, I didn’t know anything about what the campus looked like. I never really went to that part of town. But I arrived and said “Let’s get rolling.” I had a team meeting and all the players were really locked into every word I said. Although I played point guard and you are used to people looking at you and listening and doing what you say, this was different. I had a different feeling looking in their eyes looking at me. It seemed like an instant love affair with not the players themselves, but the situation and the impact. They were just like little puppies waiting to be trained. From there, the relationships I had with those players grew stronger. They are still friends of mine and some of them work with me here at South Carolina. The impact I had in their lives and the impact they had in my life, I wanted that to continue. I wanted to impact young people in that way. I had a fascination with being a dream merchant for young people and being a positive influence to help them grow. The best way to be able to help them is to allow them to be heard. I think coaches have a tendency to just talk and talk and talk and talk and you don’t really know if your message is being heard. You know you are delivering it, but you don’t really know if your message is being heard. The basketball part of it takes place on the court, but taking a vested interest outside of basketball really allows me to have more of an impact on the court. I think it helped that I was still playing in the WNBA when I was at Temple because that is something they all aspired to do. I only had the school year to really get to know them since I was still playing, but I made sure we got as close as possible when I was there and they came to watch me play in Charlotte with the Sting. They came to visit me and took time in their lives to come and watch me play, so it was a relationship that was vested on both parts. My entire time at Temple, I had a great relationship with our players. When I left, I brought the team together to say I was taking a job at South Carolina. I told them sometimes you have to make decisions that are selfishly best for you and some of the players didn’t like the fact I was leaving them because I had recruited them to Temple and pretty much told them I would be here, not knowing the business side. Some relationships were broken because of that, and I still feel bad to this day. But I am sure they had to make decisions in their young lives that would benefit them versus benefitting the masses. It was very different when I got to South Carolina. Honestly, I didn’t think the players here loved basketball. It was just a hobby for them, and if you don’t love basketball, I am not the coach for you because we ask you to do stuff out of the love for the game. The first two years, I thought it was professional suicide. I was really frustrated my first two years because they didn’t understand me and I didn’t understand them. I thought everything was related to basketball because that was my life. The “aha moment” came when one of my assistant coaches, Lisa Boyer, came up to me and said “I think you lost them. They are tuning you out. They are not listening to you.” I had a few choice words for her – I mean I flew off the handle a little bit because you never want to think you lost control of your team and never want to think your message is not being delivered or not being heard. That is the essential impact piece of the player-coach relationship. You have to make sure things you are saying are being heard. So I did step back and process things and really took Lisa’s words to heart and I changed. I looked in the mirror and said “if it’s me than I have to do something differently,” and what I did was I talked less and listened more. I involved the team more in the preparation for games. I created a dialogue with the team and I brought them in individually and talked to them a lot more. I made them more a part of the process and it worked out great. It is much harder to reach kids now with all the social media and outside noise. It’s damn near impossible honestly. I tell every recruit I sit across from I am my best when my players are true to themselves – good, bad or indifferent. I have the strongest relationships with the players that are willing to be who they are. If you make a bad decision, just let me in on the process. Nobody is perfect. We all make mistakes. But I can help you more if you don’t keep me in the dark or sneak around. Take for instance, A’ja Wilson. She used to come to my office and sit down to talk. One day, she broke up with her boyfriend and couldn’t move. She was stuck. I am like “OK, tell me about him. We will talk.” I told her what is going to happen is you are going to be back with him next week right? So let’s go ahead and give this your moment to cry. But you will be back with him next week. It’s not a bad thing. Some people think it’s a bad thing allowing a coach to know your heart is broken, like we don’t know it by your play on the court or reflected in your grades. You are just not verbalizing it, but you are showing it. I tell our recruits I can be better for you if you allow me in on all of your life, not just the basketball. I want young people to live their true selves – good, bad or indifferent – just like us adults. I am getting older and I find myself just saying what is on my mind. I am really fortunate to work with people who really understand that and are accepting of me. There is no better place to be than living your true self. That doesn’t mean mistake free, and I may say something that hurts your feelings. But if I recognize it, I will say I’m sorry and if I don’t recognize it than come and tell me and I will say I’m sorry. There is more than one way to skin a cat. As leaders, you have to be able to know when you need to self evaluate and when you need to change so you can reach the people you need to reach. I am always reflecting and really trying to get better. I am still always looking to be challenged. 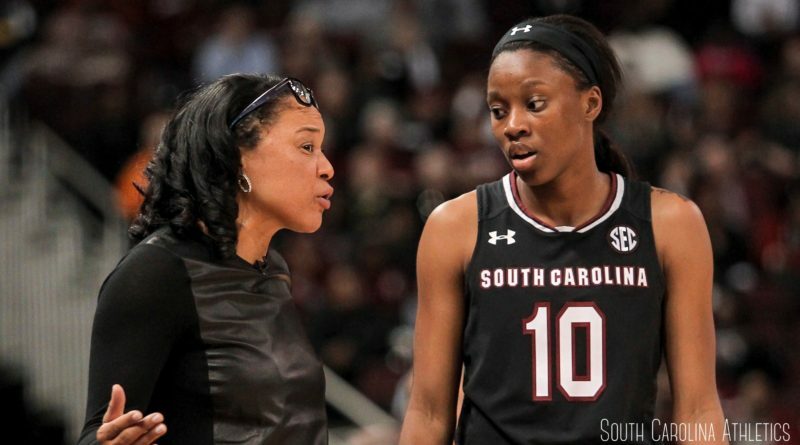 Coaching is not Dawn Stanley’s job; rather, it is her mission in this time of her life! God is guiding Dawn for His purposes! What an awesome story! Thank you. Dawn, I have followed your career since you played for UVA, Richmond Rage, Charlotte Sting and as Coach Staley. True professional!